Q: There have been many mummy show s at museums lately. What's unique about "Wrapped! Search for the Essential Mummy"? A: While Wrapped! 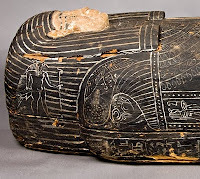 includes hundreds of ancient Egyptian artifacts, this exhibition focuses on Western society's fascination with mummies, and how the study of mummies has evolved. When explorers began pulling mummies from Egyptian tombs, these precious artifacts were sold in large marketplaces. Scientists of the day "unrolled" mummies, destroying them in the name of research. Thanks to modern technology, today we can examine them with such forensic tools as DNA testing and CT scans, which tell us more about the mummies without damaging them. Visitors can see plaster busts of mummified individuals created from scans and get an impression of the real people who were mummied. In addition, we animated CT scans so visitors can view 3-D "fly-throughs" and see mummies from the inside out. The show also devotes a good bit of time to the science and mythology of mummification. Q. Tell us about the father and son exhibit. A. 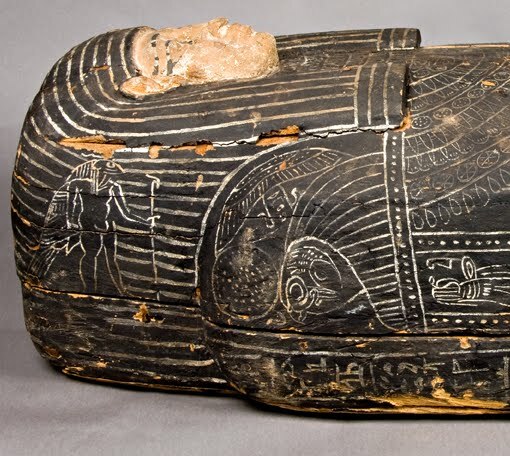 While studying our own 2,300-year-old mummy, Pahat, we discovered that he was the father of Shep-en-Min, the man behind the mummy in the collection of Vassar College, less than 75 miles away. Shep-en-Min is on view during Wrapped! ; this is the first time in U.S. history that a father-and-son pair of mummies have been exhibited together. Q: Suppose I'm not into mummies? A: Our companion exhibition, "Nancy Graves: Journey to North Africa," features camel-inspired artwork in multiple media by the first female artist honored with a solo retrospective in the Whitney Museum, including her pioneering art film of camels in Morocco, "Izy Boukir." Graves literally grew up in Berkshire Museum; her father Walter Graves was assistant director here for many years. Q. I know that you are proud to highlight work of local talents. A. Yes, also on view is "Joe Wheaton & Susan Rodgers: Spatial Relationships," new work by two acclaimed Berkshire-based sculptors whose reputations extend far beyond the county's borders. And "Ven Voisey: Artifact" features work created by a North Adams-based multimedia artist during his residency at Berkshire Museum. Plus there's always our Hall of Innovation, our rotating galleries of fine art and antiquities, the natural science collections, our award-winning Hall of Innovation, and our aquarium. There's plenty to see here if mummies aren't your cup of tea. Movie lovers can attend indie films every night during our 20th anniversary season of Little Cinema!